Pexgol concentric spigot reducers are available according to the following table. Other sizes are available by special order. The working pressures and temperatures of the Pexgol spigot reducers are the same as for the d1 side of the reducer. The following table lists the dimensions of standard spigot reducers. The sizes in the table are a partial list only, and other sizes are available upon request. 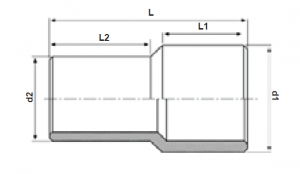 When using the Spigot reducers to connect them with electrofusion couplers, the end user can shorten lengths L1 or L2.